Guests at Matava have the opportunity to see native flora and fauna, dolphins, turtles, hump back whales during their annual migration north (Jul – Oct), incredible varieties of soft and hard corals, dozens of species of birds, butterflies and as well as tropical fish, mantas and ocean critters. The flora of Fiji comprises of hardwood trees, mangroves , bamboo, and palms. The fauna is made up of native mammals like bats , skinks , iguanas and geckos. Fiji has around 162 species of birds , which include owls, hawks and parrots. Snakes and lizards are also commonly found in Fiji. The only native mammal found in the Fiji islands is the bat. There are 6 species, 3 of which are fruit bats. Of the three species of fruit bat, the one you are most likely to see is the Polynesian Flying Fox pteropus tonganus. It is common to see large fruit bats fly over the resort in the early evening, particularly when the mango trees are ripe with fruit though they are rather difficult to photograph ! Fruit bats do not posses the ability to echo-locate but instead have large eyes adapted for nocturnal vision and an excellent sense of smell. Guests sitting on the main bure front deck in the evening often hear what sounds like bat ‘clicks’. They are in fact the White-rumped swiftlet using its ability to echo-locate flying insects and catching them on the wing over the front lawn. There are 27 species of reptiles of which 8 are endemic to Fiji. Two Iguanas, 12 Skinks, 10 geckos and 3 snakes. How iguanas arrived in the Fiji islands is a bit of a mystery. There are two species here and both are related more closely to the jungle iguanas of Central America rather than those marine iguanas of the Galapagos islands. At present the best theory is rafting. 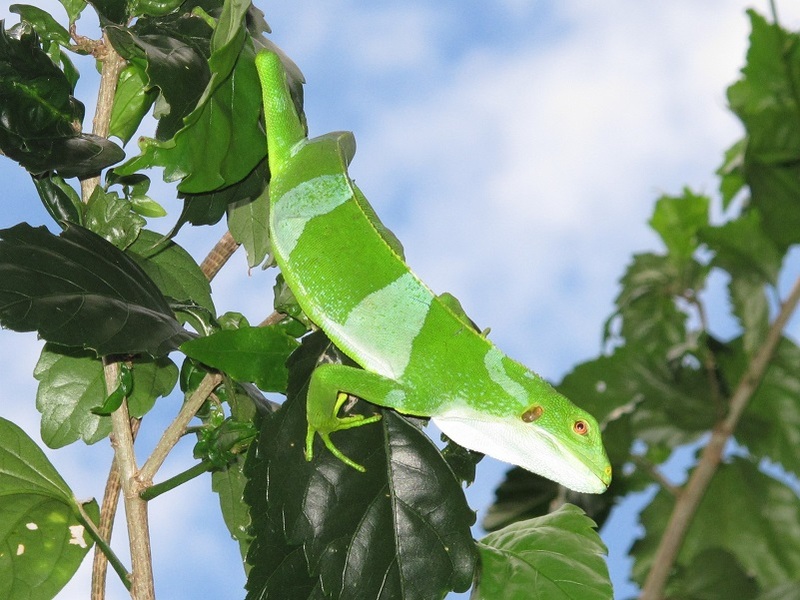 The Banded iguana Brachylophus fasciatus can be found on Kadavu island. It is a master of camouflage and difficult to find. I have watched one being released into a tree and it just disappears right in front of your eyes. 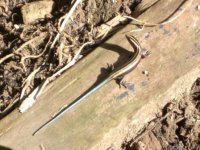 These little skinks can be seen basking in the sun during the day but scamper away when you approach. The most common species seen around the resort are the green skinks and blue-tail skinks. Rarely seen during the day, the geckos come out at night to catch insects attracted to lights. A rustle in the thatch above will almost certainly be two geckos squabbling for the best vantage point, the loser usually losing his grip and falling to the ground. 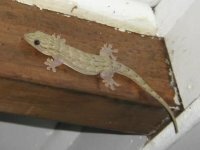 Oddly enough, a lot of Fijians are terrified of geckos. I was once sitting round a kava bowl with some of the divemasters and boatmen in the main bure. A small gecko dropped onto my shoulder and hopped off. I glanced at my shoulder and looked back. In the blink of an eye two huge burly Fijian Divemasters had turned completely white, a third had transported himself to the other end of the room and the fourth was heading full speed down the main bure front path with what appeared to be no intention of ever stopping. And just a few hours earlier these guys had been happily diving with a school of silvertip sharks….. There are three types of snake found in the Fiji Islands group. Only two of these are found on Kadavu island. (5 species – most common is Laticauda Colubrina) This sea snake is often encountered by divers who sometimes play with the animal. We do not recommend such action. Contrary to popular belief, the banded sea krait has permanently erect fangs at the front of the mouth which can open quite wide enough to bite any part of the human body. The venom is more virulent than that of any known land snake though its venom resembles that of the Cobra. Its bold black and white banding coloration is a clear warning to all. Fortunately the krait is extremely docile and given the number of people who play with them, for all intents and purposes, can be considered harmless. There is however one species that can be aggressive when provoked. Hydrophis melanocephalus is relatively rare but there has been one recorded fatal bite in Fiji. Hydrophis has a black as opposed to a white/yellow forehead, no large belly scales and never comes on land where it would be rendered helpless. 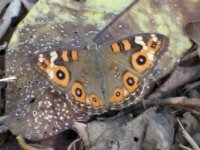 The common Laticauda has large belly scales and is therefore able to come on land to lay its small clutch of 5 to 10 eggs. They are the only group of sea snakes to do this. All other sea snakes give birth to live young at sea. Resort guests occasionally report seeing sea snakes in the shallows however the seagrass is inhabited by a small harmless eel which mimics the coloration of the banded krait. When provoked, it even goes as far as raising its tail towards the surface mimicking a krait coming up for air. Quite harmless and very beautiful. This pretty little boa is a master of camouflage. It is generally nocturnal and spends most of its time up in the trees. Not poisonous, it kills its prey by constriction and generally feeds on mice and lizards. Occasionally seen in the resort grounds, you will probably need to walk in the bush to try to find one of these little boas. Most of Fijian crabs reside on the coral reefs and seagrass flats but three types spend more time ashore than at sea. 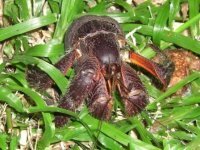 These hairy land dwelling crabs like nothing better that to cruise around at night time after a light sprinkle of rain. They use all sorts of objects as ‘homes’ though they never seem to use anything large enough to cover more than their back-side. We have seen objects such as ping-pong balls and spray can tops used and even one that lugs around a short bit of metal pipe. This fellow in the picture here is going with the traditional coconut husk look. 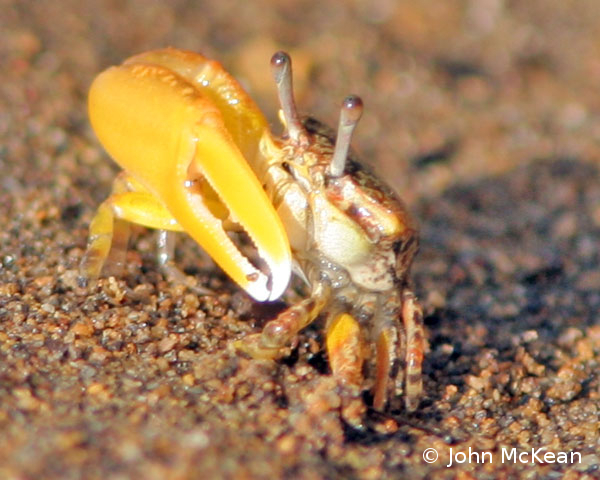 The only evidence you are likely to see of the land crabs are their numerous burrows along the front of the resort. They are rather shy and only come out at night time. 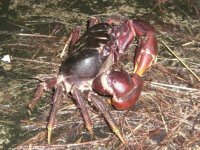 If you hear a rustling of the leaves outside your bure as you drift off to sleep, its almost certainly a land crab out for its nightly forage. The main resort grounds are relatively free of weird looking bugs but if you have a hankering to do a bit of amateur entomology, a short walk into the bush will soon have your eyes out on stalks. 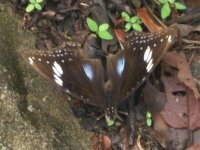 A large variety of butterflies flutter about the resort grounds. Their intricate patterns are usually very pretty and highly visible…. until they land. 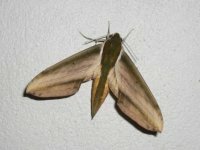 This striking moth can grow quite large with a wing span of up to 6 inches. Only seen at night, they love to hang around ripe bananas and other fruits. Their retinas reflect orange light so if you shine a torch at a bunch of ripe bananas you will see a host of little orange eyes looking back at you ! There are a few species of large spider here though unless you study the high tree canopy you will not see them. They are harmless and live way up in the very highest trees, setting their web between two high branches. Extremely hard to find unless you are prepared to examine every twig, these insects can get quite large. They get about 12 inches long. The Fijian name for them is ‘mimi mata’ which means ‘pee in your eye’. Annoy one sufficiently and that is exactly what it will do. It will squirt a noxious liquid at you. I have not tried it and don’t recommend it ! These large wasps spend their entire lives building little mud huts in which to house their young. All day long, they can be seen bumbling back and forward between a muddy spot and their mud hut. So intent on their work are they that if you stand in their set path, they bump into you and back-track thinking that they have made a navigation error. Step aside and on they go. They are not at all aggressive and to my knowledge, no guest has ever been stung.